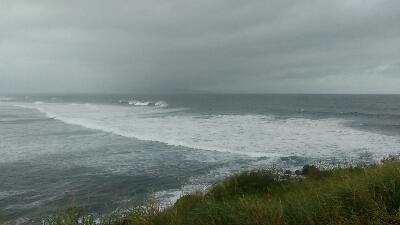 8.30am Hookipa has waves of mixed size up to double overhead, judging from where the few surfers are sitting. Just a short windsurf session for me yesterday. The waves on the north shore were chop/windswell infested, while at Honolua they were, as usual, flawless. Photo WSL/Kelly Cestari from this page. I thought they needed 3 days to complete the contest, instead they only need two, so they will likely end today. They might wait until the new stronger NW pulse fills in in the afternoon (also lower tide), as shown the buoy collage below. Check the action here. Here instead is the page to check the Sunset Beach contest. Some skilled windsurfers went out at Hookipa, here's a shot by Jimmie Hepp from this gallery. No indication of southerly energy at the buoys, the Surfline forecast calls for 1.1f 11s, and that's close to nothing. The new pulse of NW energy is up and strong at the NW buoys, while Waimea is already feeling a healthy 3.3f 20s. It does take a little longer for that to get to Maui (for details, check the Buoys to Maui travel times and Maui's shadow lines post in the labels section). The collage below shows the graphs of NW001, Waimea and the Surfline Maui forecast (link n.15). I circled the new swell on the graphs and drew a red dotted line to show how I think it will be in Maui. The new swell on the Surfline graph is indicated by the green line. In the morning there will still be plenty energy from the old swell (5.5f 13s at Waimea), but the forerunners of the new one will be already overlapping. The new swell will get bigger and more consistent in the afternoon. Pretty high windswell on tap too: 7f 9s at Mokapu (sorry, I forgot to mention that yesterday). In other words, plenty waves on Maui's north shore also today, but also today heavily ruined by wind and windswell. Wind map at noon shows moderate easterly trades. The wind has been horribly strong in the last couple of weeks and it will keep blowing for yet another one, but there's light at the end of the tunnel, or more precisely, at the end of the Windguru table. North Pacific shows a new WNW fetch and the windswell one. Nothing in the South Pacific. 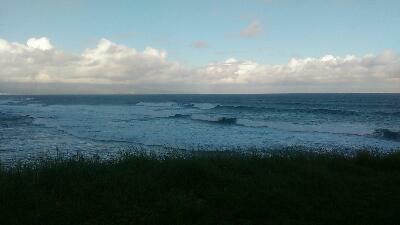 7.45am Hookipa has head and a half sets, but horrible shape because of the wind. Gonna be good windsurfing later. Double Honolua session for me yesterday, I'm loving the contest... when they call if off! I don't know if I had more fun surfing or watching the pro ladies surf. They're all incredibly good and beautiful. I obviously chatted with most of them. Smile of the day goes to Tatiana, while Courtney was wearing a wetsuit that enhanced the beauty of her shoulders and back. I also got heavily sprayed by Carissa. So much fun to be so close to such action! This is a set that pushed double overhead. And this is a wave that definitely reached it. Got even bigger by the time it got to the Cave. That was the ride of the day, all the way from the Point to the Cave. Got to love that section. He's making a crevasse in the wave with his back hand. I need to learn to slow down more to get barreled. No indication of southerly energy at the buoys, the Surfline forecast calls for 1.4f 12s. The waves in Lahaina yesterday were knee high, probably similar today. New NW swell on the rise today at all the buoys. The two NW buoys (sitting very close to each other) show 15 degrees of difference in the direction and that's why I never really trust too much the direction indication. It's more important to try to remember the fetch (scroll down to the previous days posts, if you don't). I obviously chatted with most of them. Best smile of the morning by Tatiana, while Courtney's wetsuit was showing amazing shoulders and back. 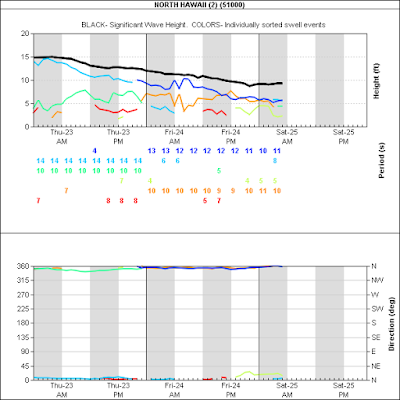 Below is the graph of NW001, Waimea and the Surfline forecast. I drew a red dotted line to show what the swell will do in Maui. Perfect timing for the contest at the Bay, which will be on for sure today and the next two days. Check the action here, first call at 7am. The Sunset Beach contest will be on too, check that action here instead. 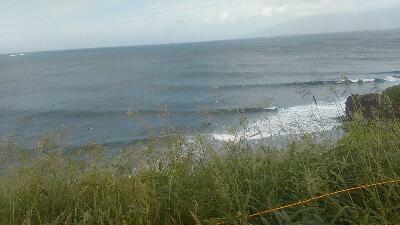 Plenty waves on Maui's north shore too, obviously blown out by the trades as usual. Wind map at noon shows moderate trades. North Pacific shows a big strong fetch NW fetch. The section circled in black is oriented towards us, but will be unfortunately blocked by the Aleutian Islands. The one in blue is oriented towards the US west coast and we might get some angular spreading. The one in red is oriented towards us, but it's fairly small and weak. There's also a local windswell fetch. South Pacific shows a mini fetch that I'm afraid won't do much. Morning sky looks clearer than the last couple of days. 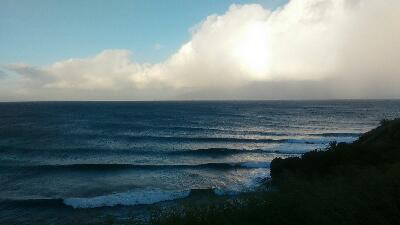 9.45am improving conditions at honolua bay with very light offshore wind and perfect texture. This set was a head and a half and an 8.5. Not sure if it was more fun surfing or watching the girls rip. Probably going out again later, so possible update afterwards. 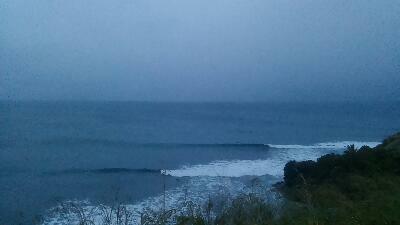 6.45am honolua bay has inconsistent sets up to occasionally a little over head high. Tide looks pretty full already. Carissa just paddled out, I might have to join her. All work no play for me yesterday (good day for that), I'll make sure I'll catch up today. Si Crowther has been shooting the warm ups at Honolua, this is Carissa Moore last Friday in a shot from this gallery. No indications of southerly energy at the buoys, the Surfline forecast calls for 1.5f 14s, so there might be small waves probably in the knee high range. There was some wrap yesterday in the Lahaina-Puamana area and there might be some today too. At 2am the NW001 buoys shows the new NW swell predicted to pick up tonight as 1.9ft @ 18s from 343°. At 18s it takes 14 hours for the swell to get here (GP's rule of thumb: 16h @16s +-1h -+1s) and that is in line with the Surfline forecast reported below (yellow line). As you can see, the swell will peak tomorrow and there's an even bigger one (blue line) predicted to pick up Thursday and last all Friday. I believe the WSL ladies only need three days to complete the contest, my guess is that they're going to wait until tomorrow and run it three days in a row. It's also possible that they're going to go on hold today to check how the swell will pick up in the afternoon, but that's a slim chance. Despite the fact that there will be waves from the existing northerly energy already in the early morning, I don't think they'll start this morning, since it's also high tide. We'll see. Once again, this is another example of how important the indication of the energy of each single swell on the Surfline buoys page (link n.11) is. Below is what you get if you check the NOAA page for the NW001 buoy instead: only 8s windswell and/or 10s NNE swell. Very far from reality and extremely deceiving. As far as the existing northerly energy goes, Waimea and Mokapu show around 4f 14-15s, but Maui could actually have even more than that, since the Big Island Hilo buoy shows a healthy 8.8ft @ 14s from 1° (N). 4m update for Waimea is 5.6ft @ 13s from 358° (N) and for Mokapu is 7.1ft @ 12s from 359° (N). Plenty size out there. The north shore will be blown out again as the wind map at noon shows moderate trades. North Pacific shows a strong NW fetch and a windswell one. South Pacific doesn't offer anything of relevance. Morning sky. Clouds don't look as thick as yesterday, maybe we'll see bits of sun today. 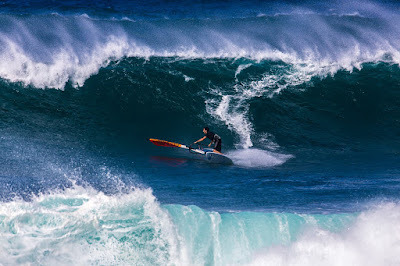 Knowing that they wouldn't run the contest, I went to Honolua yesterday and surfed it. Here's a brief interview with three of the WSL commentators. And here's some shots I took after my session. Tyler Wright was wearing a big knee brace, but she didn't seem hindered by it at all. Very impressive display of aggressive surfing almost always ending her turns with the board facing the other way. She's in the first four shots. Surprising indication of southerly energy at the SW buoy. The surprise is not that there is southerly energy, but that the buoy was able to detect it while being battered by 11.5f of 9s windswell. Lahaina side yesterday was pretty much flat, it could be that the angular spreading swell took one day longer to do that almost 90 degrees turn, so today there should be something instead. The area around Puamana might also have some wrap from the northerly energy. The new long period northerly swell arrived during the night and it's pretty healthy at around 6f 14s, but not as big as the last one. What's also worse in this case, is the very high windswell that Mokapu records at 10f 9s from 38. A lot of that will squeeze into the Honolua Bay waves creating a noticeable wobble in the lip line. It'll be interesting to see if they run the contest today or they'll wait for better days. West side is the place to go anyway, as the north shore it's too damn windy to surf anywhere. Wind map at noon shows strong trades. North Pacific shows a solid NW fetch. Back to back NW swell coming up from mid week on. South Pacific shows clear signs of summer. Morning sky shows that we did get covered from that high band of clouds. Not much sunshine today. 8am honolua is mostly flat, but once in a while there's a short period set. I saw two like the one in the photo in half an hour. High tide not helping. No contest, obviously. I got a sweet interview with the wsl commentators that I'll post tomorrow morning. 7am lahaina side is flat, south swell not hitting. Strong offshore along the road and light onshore in town. Gonna go check the bay, report later. Windfoiling in the harbor saved my day (from the ocean activities point of view, of course) yesterday. Conditions were quite bad for surfing/windsurfing pretty much everywhere (other than Honolua, maybe) and I was really glad to have that option. Really fun long little lefts all the way across. Looks like someone else is using a Gofoil surfing foil for windfoiling (specificanlly the Maliko) and riding waves with it. I left a comment on the Vimeo page telling him to try installing a box more forward to experience much more maneuverability. That's pretty much what I was doing yesterday and, trust me, like any other foiling discipline, it's more fun that it looks. No indication of southerly energy at the buoys (no surprise, seen the strong northerly energy still hitting them), but the forecast calls for a new low long period pulse (1f 16s). Below is the South Pacific map of last Sunday showing a strong fetch aimed at the Americas. I'm probably going to check out the Lahaina side because I have a building trust in those angular spreading swells and because the wind is just too strong on the north shore to find clean waves. Stay tuned for a beach report. A new long period N swell is predicted to pick up late today. Those 17 and 20s readings at the N and Waimea buoys could be it. Disregard the direction, because the buoys are battered by the much stronger short period windswell in the water. No contest at Honolua (or on hold until the afternoon) is my call for today, I'm pretty sure they're run tomorrow though. For today, short period northerly energy together with the local windswell is the energy in the water, almost impossible to find a clean spot for surfing. The usual wind model didn't get updated, here's the two models at the bottom of the Windguru page showing strong trades for today (and tomorrow). Notice the heavy cloud cover for tomorrow, probably those clouds SE of us in the satellite image below will move over the island. North Pacific shows a sign of change with a proper NW fetch and a small windswell one. 9f 15s from 339 is the Surfline prediction for Wednesday and that is absolutely perfect for Honolua (as the Molokai shadow line sits at 335). The women's world title will be decided in big barrels. Let's hope the same happens at Pipe for the men. South Pacific shows a fetch oriented towards the Americas. Hopefully we'll get the angular spreading of it in a week. 7.30am no contest at Honolua today, here's how it looks from the WSL webcast. Might be a fun day to surf with the top girls in the world... if you can find a parking. 7am Hookipa still has double overhead sets, all washed out and stormy. Three guys out at pavilion under the rain. A longboard and windsurf session on the west side for me yesterday. The windsurfing was much better than the day before (Browzinho agreed with me) as the wind was lighter and more offshore and the waves were much cleaner. I gave it a 7.5. Two days ago was a 4 for my taste. This photo by Jenn Biestman shows Silvana Lima tucking into a beauty at Honolua yesterday. The women's contest waiting period starts today and lasts until Dec 6, as does the men's Sunset Beach WQS one. These couple of shots show the wrap at Puamana mid morning. This guy was so casual in his cross stepping. In comparison, I look like a drunk man when walking to the nose. Towards the end of the day, I stopped by the harbor and as you can see there was still plenty energy in the water, but the wind was on it. The buoy in the middle had some size too, but high levels of crumbliness because of the wind. No indication of southerly energy at the buoys, the Surfline forecast calls for 1.2f 12s (which is barely noticeable). Tomorrow there should be a new small pulse at 1f 15s. 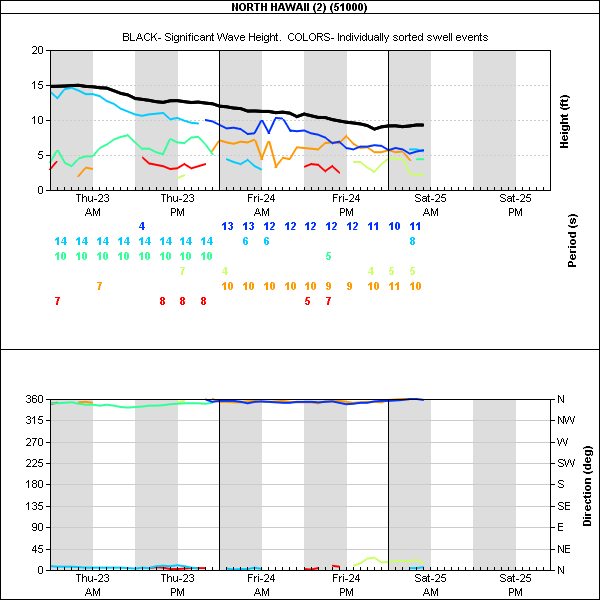 N swell tapering down as the N buoy graph below shows, but still at 7f 9-10s plus 5-6f 11-12s at the Oahu buoys. There should still be plenty energy in the water on the north shore, but not particularly clean because of the mix of short/medium periods and the wind. 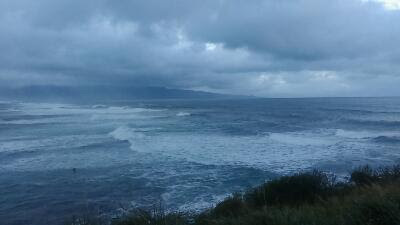 I will post an Hookipa report this morning, but expect poor conditions. North Pacific continues to show northerly fetches, and even though aimed to the east of us, we should get some angular spreading. Little NW fetch too. South Pacific shows a nice fetch oriented towards the Americas, of which we will hopefully get a bit of angular spreading, starting next Saturday and peaking Sunday December 3rd at 1.6f 16s according to Surfline. Morning sky. Those clouds are moving towards NE.